Most of us did it today, and if not, we will be doing it tomorrow. Yet most of us feel very uncomfortable discussing our bowel movements with anyone including our health care professionals. As unpleasant as these discussions are, stool consistency is about the only gauge we have to assist you with appropriate dosing of pancreatic enzymes. Why is fat content of the stool most important: Healthy people, excrete less than 6 grams of fat per day even if intake is increased to 100 to 125 g of fat/day. The average American consumes about 80 grams per day. Most patients experiencing steatorrhea excrete more than 20 gram of fat per day in their stool. The pancreas normally responds with between 700,000 and 1,000,000 lipase units (USP) per meal. The activity of the lipase in patients with EPI (exocrine pancreatic insufficiency) is generally 10% of that of healthy individuals. Since all three enzymes (amylase, protease and lipase) are excreted together, lipase is used to determine the appropriate dose of pancreatic enzyme supplements. Absorption: Of all the macronutrients (fat, carbohydrates, and protein), the absorption process of fat is the most complex and tends to be the most sensitive to interference from disease processes. Calories: Fat is the most calorically dense macronutrient and, therefore, its malabsorption is a critical factor in the weight loss that often accompanies malabsorptive disorders. Protein and carbohydrates contain 4 kcal per gram, while fat contains 9 kcal per gram. Degree of steatorrhea present- Tell your doctor about the consistency of your stool. Do their stools float on the top of the water in the toilet bowl? Fat content of the diet: Sometimes a consult to a dietician is necessary. Restriction of the fat content to 20gm per day is recommended. If this is unsuccessful, pancreatic enzymes need to be taken. Remember though that fat is an important macronutrient. Medium chain triglycerides (MCTs) can be supplemented to provide extra calories in patients with weight loss and a poor response to diet and pancreatic enzyme therapy. Your Thompson Pharmacist can special order this supplement for you. Of course, before we make any adjustments to therapy, your pharmacist will want to measure your understanding about the pancreatic enzymes. 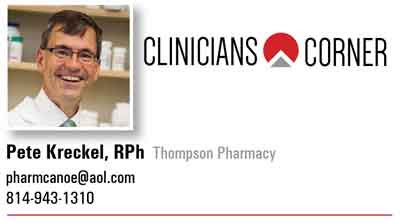 Your Thompson Pharmacist is here to help you, even when discussing the consistency of your bowel movements! Go ahead an ASK… at Thompson Pharmacy it’s all for you!